Some of you might recognize the name of Starr Meade already. I know that I've only recently begun to sit up and take notice when her name is mentioned. Earlier this year I had the opportunity to review the Mighty Acts of God Family Story Bible by Meade (linked to my review) and so when I saw that Crossway Books was releasing some titles in a "God's Mighty Acts" devotional series, I just had to check them out! I've mentioned before that I'm not a terribly huge fan of devotionals. It's not that I think that they are bad or anything. I just have a really hard time committing myself to spending a drawn out period of time with a book in small, little chunks. I feel the need to race ahead and reach the finish line. I am not a tortoise kind of reader. I'm the hare, leaping and bounding ahead of the pack, wanting to see what the conclusion is. Since I'm just reviewing these titles here, and not actually using them with young children, I read straight through them. Heh. Occasionally I have been offered and taken up devotional type books for review purposes. These days I've declined all offers to do that because I haven't really been drawn towards any devotional in particular. But if you combine Crossway and Meade them I'm inclined to take a gamble and, in this case, I'm glad that I did. 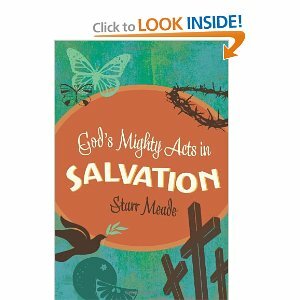 I was sent two titles: God's Mighty Acts in Salvation and God's Mighty Acts in Creation . 1. For the same reason I liked Meade's Mighty Acts of God Bible, I found that these devotionals did not try to dumb the scriptures down for young readers, assuming that they cannot understand the English language. She calls upon her readers to listen to the words and understand them. She speaks "normally" to her younger audience and unfolds scriptural truths in ways that they can understand without over simplifying. I really, really appreciate that. I dislike most Children's Bibles/devotional books because they over simplify, draw too many silly-looking cartoons, and seem to assume that children are too simple to catch hold of a deep theological truth. Meade assumes none of this but presents the truth boldly. I think too often we make the mistake of assuming our kids just "can't understand." However, I've found in teaching youngsters (in Sunday School classes and my own kids) that children can pick up on a great deal of foundational truths. We just have to take the time to find a way to explain doctrine to them. I think Meade does a fantastic job of assuming the best. I love this about these. 2. Because Meade doesn't dumb anything down, the devotional was interesting to me as well! I was able to see the dots she was connecting and found it to be a fascinating read. She was speaking in a manner that gave me the opportunity to glean as well and I appreciated that. These books are marked for ages 8-12 but I think I'd probably start using them around the age of six with my own kids. I think that they could absolutely take hold of the concepts Meade is sharing and we wouldn't have a problem grasping the message. I heartily and highly recommend these devotionals as being meaty and satisfying. They are fabulous! Thank you, Crossway Books, for the the resources and for offering me the chance to take a read through! These also look fabulous, especially for children who know their Bible well. Though mine are too old for these, I am glad to know of them. I hate cartoonish figures in Bible stories and am glad to know these aren't dumbed down. those sound great my oldest would like the acts of creation. I think you are so right that we often assume kids can't understand things that they can. I'm looking forward to reading this. And it is rare to find children's devotionals that are not dumbed down. We've been reading Meade's Mighty Acts of God Family Bible Storybook for our family devotion time, and we absolutely love it. If we forget one night, our four-year-old is quick to remind us to get out the book. These sound awesome too -- thanks for the review! We used her "Training Hearts, Teaching Minds" devotional that follows the Westminster Shorter Catechism growing up. I liked it alot - I'll have to look into these books! Annette - yes, we do use that Bible. We used it heavily earlier in the year (and have tapered off a bit) but that was the version that finally made the whole Adam/Eve in the garden "sin" thing make sense!